As Big Blue's Q3 revenue miss demonstrates, the company's top-line performance continues to trail that of many other big-name IT firms. It's hard to put a positive spin on IBM's (IBM - Get Report) latest earnings report. If the post-earnings selloff that Big Blue saw in April (following a Q1 beat that came with some fine print) was a sign that investors are running out of patience with the IT giant, and the short-lived gains it saw in July (following a Q2 beat that was driven by hardware) a sign that investors weren't yet sold on IBM's turnaround story, the tumble that IBM seeing after a mixed Q3 report looks like a sign that many investors are throwing in the towel, as key business units continue underperforming. After the bell on Tuesday, IBM reported Q3 revenue of $18.76 billion (down 2% annually, and flat in constant currency) and non-GAAP EPS of $3.42 (up 5%). EPS, which benefited from cost cuts and a 10.2% tax rate, topped a $3.40 consensus. 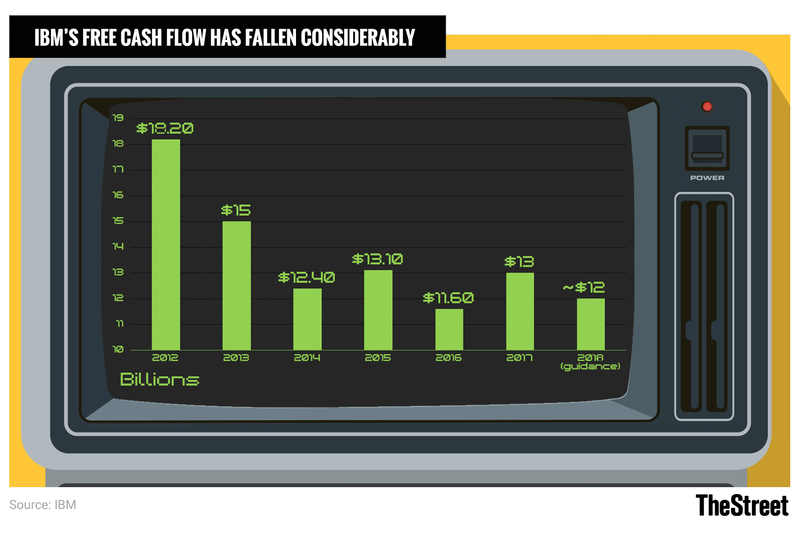 However, revenue missed a $19.1 billion consensus. The company is maintaining full-year guidance for EPS of "at least" $13.80 and free cash flow (FCF) of roughly $12 billion (down by about $1 billion from 2017). However, that's being overshadowed by worries about IBM's top-line performance, which remains markedly worse than that of peers such as Microsoft ( MSFT - Get Report) , SAP ( SAP - Get Report) and Accenture ( ACN - Get Report) (though perhaps not Oracle ( ORCL - Get Report) , which has its own set of challenges). Microsoft is a holding in Jim Cramer's Action Alerts PLUS member club . Want to be alerted before Jim Cramer buys or sells MSFT? Learn more now. Importantly, IBM's Cognitive Solutions segment, which accounts for much of its software revenue and easily has the highest pre-tax income of its four main business segments, had much to do with its Q3 revenue miss. Cognitive Solutions posted revenue of $4.15 billion -- down 6% in dollars and 5% in constant currency (CC), and below a $4.3 billion consensus. This compares with a 1% CC-based revenue decline in Q2, and comes at a time when broader enterprise software spending is pretty healthy. Research firm IDC recently forecast IT software spending will rise 7% in both 2018 and 2019. On the earnings call, CFO Jim Kavanaugh stated (much as he did in July) that Cognitive Solutions is being pressured by "secular shifts" in the collaboration, commerce and talent software markets, and that IBM is responding by modernizing its offerings. He also indicated that IBM's transaction processing software business, much of which involves mainframe software, was hurt by "the timing of larger transactions that are tied to client buying cycles." Notably, when asked whether IBM expects to hit its mid-single digit long-term revenue growth target for Cognitive Solutions in 2019, Kavanaugh declined to say yes or no. "[W]e'll get into 2019 in January," he said. " We've got a lot of work to do ahead of us." IBM's Systems segment, which performed very well in Q2 thanks to a strong upgrade cycle for the company's z14 mainframe (it launched in Sep. 2017), also stumbled a bit in Q3: Its revenue rose 1% to $1.74 billion, missing a $1.79 billion consensus. Sales of IBM's Power servers rose 16% (recent hardware launches seem to be helping), but mainframe revenue rose just 5% in spite of the upgrade cycle and storage revenue fell 6% at a time when top rivals are posting stronger growth. The performance of IBM's main services segments wasn't particularly strong, either. Global Business Services (GBS) revenue rose 1% to $4.13 billion and topped a $4.06 billion consensus. However, the Technology Services & Cloud Platform (TS & CP) segment posted revenue of $8.29 billion, down 2% and below an $8.43 billion consensus. Moreover, IBM's services backlog fell 3% annually to $113 billion, after having dropped 1% in Q2. And though this growth rate can fluctuate a lot from quarter to quarter and is promised to be much better in Q4, the company's services signings fell 21% to $8 billion. IBM is eager to talk up a different set of numbers, of course. For example, the 24% CC-based growth seen in its "as-a-service" cloud revenue run rate, and the 11% CC-based increase seen over the last 12 months in its broader "strategic imperatives" revenue, which covers offerings in fields such as cloud software/services, analytics software, enterprise mobile apps and security products. However, it's pretty clear that strategic imperatives growth is -- several years after the term "strategic imperatives" was first coined -- still being offset by revenue declines in other segments. In TS & CP, for example, total revenue fell 2% last quarter even as strategic imperatives revenue rose 14%. And as IBM's FCF pressures in recent years demonstrate, earnings quality has deteriorated amid this mix shift towards strategic imperatives revenue. IBM's stock, hurt this year both by earnings disappointments and Warren Buffett's decision to unload his firm's stake in the company, is certainly cheap at current levels. Not counting the assets and debt possessed by its Global Financing unit, Big Blue carries an enterprise value (market cap plus net debt) equal to only around 10 times its expected 2018 FCF. However, until there are signs that IBM's top-line and FCF performance won't continue to meaningfully trail that of peers, its stock has many of the hallmarks of a value trap.